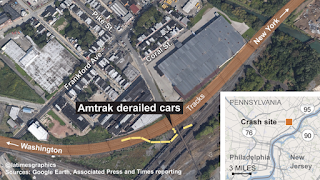 In the aftermath of the horrific Amtrak accident in Philadelphia it has become clear to me that America is not committed to affordable public transportation and that our love affair with the internal combustion engine and the automobile governs how we think and act. Trains are efficient. Unlike flying, I don't have to get to the station two hours in advance of a 30 minute train trip between major cities that might take two hours to drive. The accident in Philadelphia is highlighting how fragile our rail service remains. The entire Northeast Corridor should not be shut down for days following the accident--yet is has been. Where are the alternate rails? There apparently are too many single points of failure in the system. Part of the solution begins in Congress. Amtrak is underfunded! Congress need to take responsibility for moving America from roads and highways and onto the rails making this form of transportation more acceptable. Here is the calculus that I use. When I am planning a trip to New York City--it takes three hours by train and three hours by bus. The train is $77 and the bus is about $17. You make the choice. And than is the problem. The train should be faster for the added expense. There are faster trains, but the price doubles. The bus is cheaper than driving! The trains is about double the cost of driving--go figure. Trains need to be competitive, fast, safe, and available! We need to change the way we think about travel to make trains a viable and important option.